How do you handle problems? 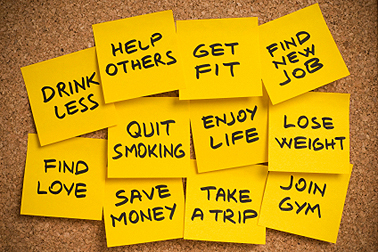 New Year’s resolutions are a way to define problems and to do something about them. Annually, one of the most common of the New Year’s resolutions is the decision to lose weight and engage in healthy activities. That is why most people who work out regularly absolutely hate going to the gym this time of year. The place is crawling with all those well-intentioned people who made that healthy resolution. What most of the regulars know is that by the time January 31 rolls around, the vast majority of the resolute will abandon their plan and go back to old habits. The problem is their New Year’s resolutions were made without much resolve. If we were to define a New Year’s resolution by our actions, we might describe it as an intention to solve a problem without a plan or the fortitude to do so. The bottom line is that defining a problem is a relatively easy thing to do. If your New Year’s resolutions are nothing more than identifying and claiming you have a problem, you have not achieved a thing. Changing our actions to rid ourselves of the problem is a very hard thing for most of us to accomplish. In fact, most people will not change until change is forced upon them. I have a friend who has known for 30 years that he needed to eat better. When he had a heart attack, his doctor told him he would not survive another such attack and if he didn’t drastically change his diet another heart attack was inevitable; only then did my friend make a change in his diet. Why must we be pushed into a corner with no other options before we are willing to change? I believe it has to do with a lack of a plan, a lack of resolve, and a desire to indulge ourselves with a very short vision of the consequences. This impacts us individually, within our businesses, our families, and just about every other significant area of our lives. Let’s take a quick look at the three-headed monster that keeps us from changing. As I mentioned, identifying a problem is easy to do. Solving a problem is much harder. It takes a plan of action with a goal in mind. In a business sense, you might want to increase your revenues. Defining a goal is the first step you need to take. How much do you want to increase your revenues? It is hard to make a plan without knowing when you have crossed the line of success. The goal is that line. But making a goal is not enough to make a change. The thing I want you to take away here is you don’t just drift into change, nor does it happen just because you have proclaimed a goal. You have to have a plan of action. How will you reach your goal? Without a plan of action, you will never do it. When we talk to clients about marketing plans, they are simply methods we intend to employ to reach a sales goal. A marketing plan tells us what actions we are going to do to reach the goal, when we are going to do them, to whom they are directed, and how we are going to measure our effectiveness. They give us a strategy and a way to measure our successes or failures. Change is hard work. There really is no other way around it. Most of us know this - it is not breaking news – which is why we resist it. Change requires going against the forces that put us in a problematic spot in the first place. Whether that is changing your personal habits or redesigning the way you do business, it will be difficult to wade through the forces that would pull us in the wrong direction. It means putting to death the habits that wage war against our attempts to change. That takes a disciplined approach to your goal and your plan. It also takes time to make a change and to see any results from your actions. The easy thing to do is to give in. The hard thing is to stick to the plan you have made to get you out of the problem. It is most difficult in the middle of the process: before you see any measurable results. This is where the voices of compromise start to work upon our psyche. Give an inch and you will soon find that you are back in the same spot where you started. You have to be rather fanatical about it. Fanaticism has taken a bad rap in our society. It is seen as too extreme; too radical… at least that is what the whispers of compromise will tell us. Resolve to stick to your plan regardless of criticism – that which comes from the outside and that which comes from inside your own head. It always humors me when I think that New Year’s resolutions come on the heels of one of the most over-indulgent times of year. From Thanksgiving to New Year’s Eve, we eat too much, drink too much, shop too much, spend too much and indulge in just about every other habit that we will swear off come January 1. The fact of the matter is, we like to please ourselves. Every year I hear experts – from doctors to financial planners – explain the virtue of moderating our bad holiday habits that we will pay for down the line. Every year, their advice is ignored until the calendar rolls over and we make the resolution – once more – that we will be better, only to repeat the same self-indulgent actions the next year. We don’t think past the immediate way we feel when we are eating too much or spending too much. We just live for the pleasure we feel in the moment without a thought of how it will harm us down the road. Let me play amateur psychiatrist here: That’s nuts! Yet, that is where most of us find ourselves. Part of change has to be seeing past today. Will my actions today have a negative outcome for the goals we have set? Will it slow our pace towards change or is it setting us back? Another dirty phrase in our lexicon is delayed gratification. In other words, can I do without something today to get it another day at a better price or at a time when I can better afford it? Don’t get me wrong, there is nothing wrong with pleasure per se. I prefer pleasure to pain. But I must see it for what it is: something that helps me or something that hurts me in the long run. If you are to make a change and accomplish your goals in the new year, you will have to give up some sort of pleasure in the here and now to make it. Expect to come to that crossroads somewhere along the journey. Resolve yourself now to make the right choice when you get there and it will be easier to say no to the temptation to over-indulge. I have found in my own life that little gets done unless I make myself accountable to someone who will challenge me to stay the course. That takes some vulnerability. Years ago I sat down with a businessman for whom I had a great deal of respect. He explained how he had formed a peer mentoring group with other business leaders. They got together each year to present their goals to each other – both professionally and personally. They even went as far as opening up their financial statements for the others to read. For the rest of the year, they would call each other to see how things were progressing. He said after he got over the initial shock of someone else looking into his "business,” it was quite a helpful process. You may need a coach. You may need a very honest friend. Whatever you need, don’t let fear keep you from finding a person or a group of people who will hold you accountable to take the steps needed to reach your goals. New Year’s resolutions are really defined by our actions. Typically all they mean is that we will break an all-important promise to ourselves by the end of the month and end up the worse for it. Change is hard work, but worth it in the end. Otherwise, your goals will remain unaccomplished and you will be mired in your own inability to get past the obstacles that keep you from changing – namely, yourself. Here’s to the New Year and a change for your betterment that you see all the way through to your goals.